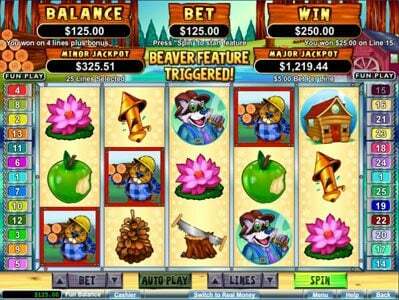 Builder Beaver is a free demo 5 reel online slot machine with a maximum payout of 50,000 using the beaver theme. Builder Beaver Slots 4 out of 5 based on 5 ratings. 5 user reviews. 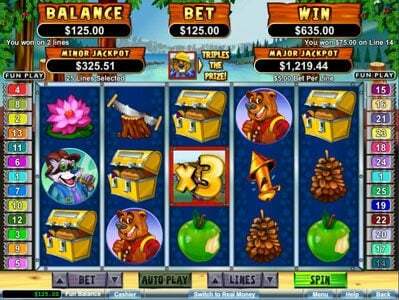 Builder Beaver is a 5 reel, 25 payline progressive Real Time Gaming slot. It includes scatter symbols, wild symbols, two different free spin features and two progressive jackpots. The theme in this one is fantastic as it takes you into the busy lives of beavers and the work they do to create their homes. It includes a comical look through the use the characters that appear. The background images fill the screen with piles of trees, a river, saw mill and distant trees waiting for harvest by those pesky beavers. When you begin to look over the paytables you will enjoy additional images of the trees and river and a fence. The symbols have been thought out nicely in Builder Beaver and you will find an accord, a flower, a lunch box, two men saw, a log cabin, a racoon, a bear, a pretty female beaver, apples and a whistle used for quitting time. 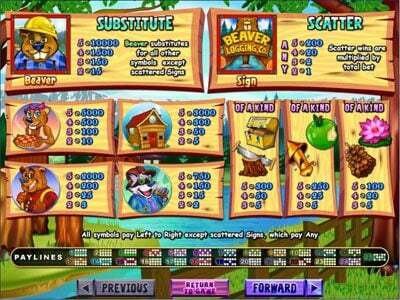 The added slot feature symbols are the Beaver Logging symbol and the Beaver himself. You can be sure you will get a kick out of this slot. The graphics and sounds are great and you will find the symbols look fantastic on the reels. You have all of the standard RTG betting options available and get wager as little as $0.25 per spin or as much as $25 per spin, the choice is yours to make. What is great about this is it means all levels of players will be able to enjoy this Slot to its fullest and that always helps to keep people happy. The Beaver is a valuable member of the wild and he is no different in this game as he will act as the wild and will match any other of the base game symbols. He will also award you with a coin win if two or more appear on an active pay line. This commences with 15 coins for two, 150 coins for three, 1500 coins for four and 10,000 coins if you get five on an active payline. He will also award you with 12 Free Spins that will see all wins tripled! This occurs once a minimum of three appear in any position on the five reels. The free spins can also be won again during the first set of spins that were awarded. The second free spin feature is won with the Beaver Logging Co symbol. This one will trigger 10 free spins with all wins being doubled. When one of the Beaver Logging co symbol lands on the reels it will turn wild during the free spins and since the main wild symbol is in play during the free spins it means some big wins can occur. The free spins can be triggered again in this Free Spin feature as well. To win the progressive you only need to spin the reels as it is awarded randomly. That means it does not matter how much you wager as all wagers have an equal opportunity to win the jackpot. This is a great game with a theme that will be loved by all due to the cute and comical characters it includes let alone the generous features. Take some time to play this one today. Be sure when you use a free bonus code from Cool Cat casino as with most operated casinos, you are required to make a deposit if your last bonus was a no deposit one. American Samoa, Andorra, Anguilla, Argentina, Aruba, Barbados, Belgium, Bermuda, Cayman Islands, Chile, Cook Islands, Greece, Guam, Guyana, Iceland, Japan, Luxembourg, Marshall Islands, Martinique, Mayotte, Mexico, Monaco, Montserrat, New Caledonia, Niue, Norfolk Island, Northern Mariana Islands, Portugal, Puerto Rico, San Marino, South Africa, Spain, Swaziland, Sweden, Switzerland, Tokelau, United Kingdom, Uruguay and Venezuela countries are not able to play at Cool Cat. Be sure when you use a no deposit casino bonus code from Sloto Cash as with most run casinos, you have to post a deposit between no deposit Online Casino Bonuses. Aladdins Gold terms state that you must make a qualifying deposit between no deposit casino bonuses to be able to process a cash out. Costa Rica, France, Ireland, Isle of Man, Israel and United Kingdom locations are restricted at Aladdins Gold. Do not use multiple free Casino promotions back to back as your balance may be voided without a deposit. Diamond reels is restricted in Chile, Denmark, Finland, Japan, Philippines, Poland, South Africa and Turkey countries. Take care you do not use multiple no deposit promotions at Captain Jacks as they may not pay you for not following the rules. Free Spin terms state that you must make a qualifying deposit between no deposit bonuses to be qualified to make a withdraw. Do not use multiple No Deposit Casino promotions back to back as your balance may be removed without a deposit. Take care you do not use more than one No Deposit Casino bonus back to back at Free Spin as your winnings may be removed without a deposit. Be sure when you use a free Casino Bonus code from Aladdins Gold Casino as with most RTG powered casinos, you have to make a deposit if your last casino bonus was a free one. Note that Costa Rica, France, Ireland, Isle of Man, Israel and United Kingdom players are not permitted to play at Aladdins Gold casino. Do not use multiple free Bonuses back to back as they may not pay you for violating terms and conditions. Do not use more than one free promotion at iNET Bet as your balance may be voided without making a deposit. iNET Bet Casino is prohibited in Afghanistan, Albania, Armenia, Azerbaijan, Belarus, Bosnia and Herzegovina, Bulgaria, Costa Rica, Croatia, Czech Republic, Denmark, Estonia, France, Hungary, Indonesia, Iran, Iraq, Latvia, Lithuania, Malaysia, Moldova, Montenegro, Pakistan, Romania, Serbia, Slovenia, Turkey, Ukraine and Zimbabwe countries. Be sure you do not use multiple no deposit bonuses as they may not pay you for violating terms and conditions. iNET Bet is prohibited in Afghanistan, Albania, Armenia, Azerbaijan, Belarus, Bosnia and Herzegovina, Bulgaria, Costa Rica, Croatia, Czech Republic, Denmark, Estonia, France, Hungary, Indonesia, Iran, Iraq, Latvia, Lithuania, Malaysia, Moldova, Montenegro, Pakistan, Romania, Serbia, Slovenia, Turkey, Ukraine and Zimbabwe locations. Do not use multiple No Deposit Casino promotions back to back at La Riviera as they may not pay you for not following terms and conditions. Do not use multiple no deposit casino bonuses at Sloto Cash as your balance may be removed without making a deposit. Do not use multiple no deposit bonuses as they may not pay you for not following terms. La Riviera terms state that you have to make a deposit between multiple Free Casino Bonuses to be allowed to make a withdraw. Be sure you do not use more than one free Casino Bonus back to back at Grande Vegas as your balance could be voided without a deposit. 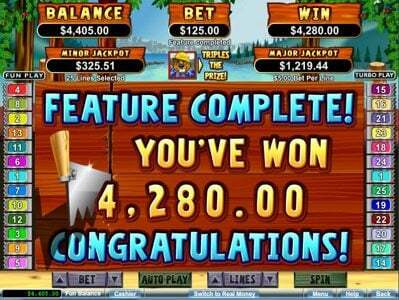 Do not use multiple free Bonuses as your winnings may be removed without making a deposit. Grande Vegas requires that you must make a qualifying deposit between No Deposit Casino Bonuses to be allowed to make a cash out. Do not use multiple free promotions at Slotastic as your winnings may be voided without making a deposit. Take care you do not use multiple No Deposit Casino promotions back to back at Slotastic as your winnings may be voided without a deposit. Casino Extreme terms state that you must make a deposit between multiple Free Casino Bonuses to be allowed to process a withdraw. Be sure you do not use more than one free Casino promotion at Slotastic as your winnings may be voided without a deposit. Be sure when you use a free bonus code from Slotastic casino as with most RTG operated casinos, you have to post a deposit between No Deposit Casino Bonuses. Do not use multiple free promotions at Uptown Aces as your winnings may be voided without a deposit. Slotastic terms state that you have to make a qualifying deposit between no deposit bonuses to be allowed to process a withdraw. iNET Bet terms state that you have to make a deposit between no deposit bonuses to be allowed to process a cash out. Note that Afghanistan, Albania, Armenia, Azerbaijan, Belarus, Bosnia and Herzegovina, Bulgaria, Costa Rica, Croatia, Czech Republic, Denmark, Estonia, France, Hungary, Indonesia, Iran, Iraq, Latvia, Lithuania, Malaysia, Moldova, Montenegro, Pakistan, Romania, Serbia, Slovenia, Turkey, Ukraine and Zimbabwe players are not allowed to play at iNET Bet casino. Take care you do not use multiple no deposit bonuses as your balance may be removed without making a deposit. Take care you do not use multiple no deposit promotions back to back as they may not pay you for violating the rules. Do not use multiple free Casino promotions as they may not pay you for violating terms. Do not use more than one No Deposit Casino Bonus back to back at Grande Vegas as your winnings could be removed without making a deposit. Be sure when you use a No Deposit Casino bonus code from Planet 7 as you know with RTG powered casinos, you must post a qualifying deposit if the last Bonus was also a no deposit one. Note that American Samoa, Andorra, Anguilla, Argentina, Aruba, Australia, Austria, Barbados, Belgium, Bermuda, British Virgin Islands, Cayman Islands, Chile, Cook Islands, Finland, Germany, Greece, Guam, Iceland, Japan, Luxembourg, Marshall Islands, Martinique, Mayotte, Mexico, Monaco, Montserrat, New Caledonia, New Zealand, Niue, Norfolk Island, Northern Mariana Islands, Norway, San Marino, South Africa, Spain, Sweden, Switzerland, Tokelau, United Kingdom, United States and Venezuela players are forbidden at Planet 7. Do not use more than one no deposit Casino promotion back to back as your winnings could be removed without making a deposit. Cool Cat Casino is restricted in American Samoa, Andorra, Anguilla, Argentina, Aruba, Barbados, Belgium, Bermuda, Cayman Islands, Chile, Cook Islands, Greece, Guam, Guyana, Iceland, Japan, Luxembourg, Marshall Islands, Martinique, Mayotte, Mexico, Monaco, Montserrat, New Caledonia, Niue, Norfolk Island, Northern Mariana Islands, Portugal, Puerto Rico, San Marino, South Africa, Spain, Swaziland, Sweden, Switzerland, Tokelau, United Kingdom, Uruguay and Venezuela locations. Slotastic terms state that you must make a deposit between multiple Free Casino Bonuses to be allowed to make a withdraw. Do not use multiple free Casino promotions at Ruby Slots as they may not pay you for violating terms. Take care you do not use more than one free bonus at Raging Bull as they may not pay you for violating terms. iNET Bet terms state that you have to make a deposit between No Deposit Casino Bonuses to be allowed to process a withdraw. iNET Bet Casino is restricted in Afghanistan, Albania, Armenia, Azerbaijan, Belarus, Bosnia and Herzegovina, Bulgaria, Costa Rica, Croatia, Czech Republic, Denmark, Estonia, France, Hungary, Indonesia, Iran, Iraq, Latvia, Lithuania, Malaysia, Moldova, Montenegro, Pakistan, Romania, Serbia, Slovenia, Turkey, Ukraine and Zimbabwe locations. Do not use more than one no deposit bonus back to back at Slotastic as they may not pay you for violating the rules. Be sure you do not use multiple No Deposit Casino promotions back to back at Grande Vegas as your winnings may be voided without making a deposit. Grande Vegas requires that you have to make a deposit between no deposit bonuses to be allowed to process a withdraw. Casino Brango terms state that you have to make a qualifying deposit between multiple no deposit bonuses to be allowed to process a cash out. Take care you do not use more than one free Bonus at Grande Vegas as they may not pay you for violating the rules. Slotastic requires that you have to make a qualifying deposit between multiple free Bonuses to be qualified to process a withdraw. Do not use multiple free casino promotions as they may not pay you for violating the rules. Note that Azerbaijan, Costa Rica, Iran, Iraq, Moldova, Montenegro, Myanmar [Burma], Pakistan, Russia, United Kingdom and Zimbabwe players are not allowed to play at Kudos Casino. Do not use multiple Free Casino Bonuses back to back at Club Player as they may not pay you for not following terms and conditions. Club Player Casino is prohibited in American Samoa, Andorra, Anguilla, Aruba, Austria, Barbados, Belgium, Bermuda, British Virgin Islands, Cayman Islands, Chile, Cook Islands, Finland, Greece, Iceland, Luxembourg, Marshall Islands, Martinique, Mayotte, Mexico, Monaco, Montserrat, New Caledonia, Niue, Norfolk Island, Northern Mariana Islands, Portugal, Puerto Rico, San Marino, South Africa, Spain, Sweden, Switzerland, Tokelau, Uruguay and Venezuela locations. Raging Bull terms state that you have to make a qualifying deposit between Free Casino Bonuses to be able to process a withdraw. Bolivia, Bosnia and Herzegovina, Botswana, Bulgaria, China, Costa Rica, Croatia, Czech Republic, Estonia, Israel, Latvia, Lithuania, Nigeria, Poland, Singapore, Slovenia, South Africa and Ukraine countries are not able to play at Raging Bull. True Blue Casino terms state that you have to make a deposit between free Bonuses to be able to make a cash out. True Blue Casino is restricted in Australia countries. Do not use multiple free promotions as they may not pay you for violating the rules. Do not use multiple free Bonuses at Fair Go as your balance could be voided without a deposit. This slot is pretty fun. It has 2 different bonuses that pay pretty good. Builder Beaver is a pretty awesome RTG Slot!! I have won $30 on one spin betting only 10 cents before! You don't need to bet alot, and can play forever! Two different Free Spin Symbols and most 3 of a knid on a line pay super high! One of the newer Slots offered by RTG. A lot of RTG Casinos have been offering Free Spins on this Slot game. It has the builder sign and the beaver that triggers off the feature. I've seen someone get paid nearly 4000 credits in the feature. A definite one to spin.